At its meeting on June 22, 2015, the TTC Board will consider two reports affecting the future subway and streetcar fleets in Toronto. In the case of the subway fleet, plans have been updated to provide for implementation of four-car Toronto Rocket (TR) train operation on the 4 Sheppard subway line. For the streetcar fleet, there is an update, albeit with some doubts on the TTC’s part, regarding delivery of the new Flexity fleet by Bombardier. To condense the information about schedule and service changes, I have adopted a different format from the usual tables to show (a) all of the time periods for affected routes and (b) the periods where there is actually a change from the “standard” summer service (the pre-games period). Where there is a change, it is highlighted in red. For this type of event, the day-to-day requirements on each route are hard to predict, and so the TTC has scheduled a much larger than usual pool of standby or “run as directed” vehicles that will be available throughout the network. Schedule changes implemented on June 21, 2015 have already been detailed in a separate post. Pre-games service levels are shown for reference in the table linked below only for routes that are affected by the Games schedule changes. From Friday, July 10 to Sunday, July 26, late night repair work on the Yonge subway tunnel north of Eglinton will be suspended, and service will run until 2:00 am on all days. Weekday service on 7 Bathurst Bus will revert to regular buses on the schedule used in July 2013. 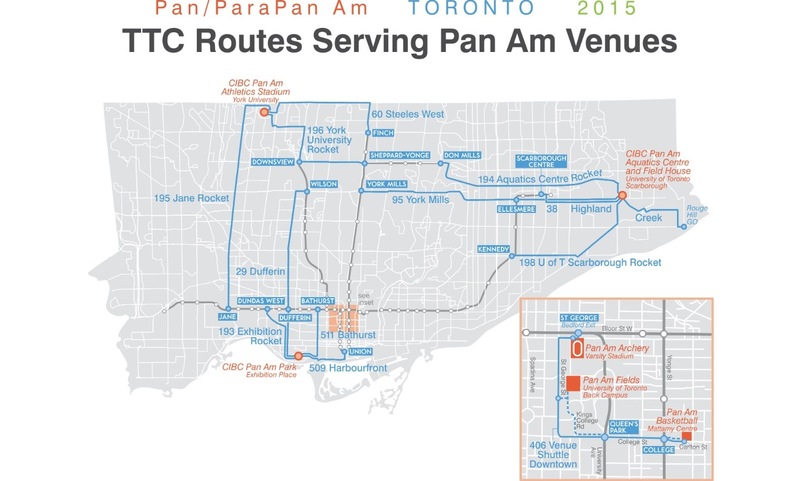 This will free up articulated buses for Pan Am routes. Low floor streetcars will operate on 509 Harbourfront, 510 Spadina and 511 Bathurst during the games period. All service on Queens Quay will be provided by Harbourfront cars, and the Spadina route will terminate at Queens Quay Loop. Buses will replace streetcars on 502 Downtowner from July 13 to 24 to free up vehicles for other routes. The 503 Kingston Road Tripper will continue to operate with streetcars. On Friday, July 10, Wellington Street will be closed after 4:00pm as part of the opening ceremonies. 503 Kingston Road Tripper cars will operate to Charlotte Loop. Because the CNE grounds will be closed, all 29 Dufferin buses will loop at Dufferin Loop (CNE western entrance). Additional shuttle service will operate between Dufferin Station and Dufferin Loop. The 329 Dufferin Night Bus will also turn back from Dufferin Loop rather than operating to the Princes’ Gates. This change remains in effect until September 6 due to the CNE. Route 116 Morningside will divert southbound via Ellesmere and Morningside, bypassing Military Trail, to avoid congestion at the Aquatics Centre during the games. Route 198 UTSC Rocket will terminate at the Aquatics Centre rather than the usual UTSC loop during the games. Route 106 York University will divert westbound in the campus via The Pond Road, York U Busway and York Boulevard to The Common because Ian MacDonald Boulevard is closed. This change began on June 15 and is scheduled to continue until September 6. Route 196 York U Rocket will operate with articulated buses and with additional service. From July 11 to August 8, 172 Cherry will loop downtown to City Hall via York, Queen and Bay to King. Route 94 Wellesley will divert via Bloor between Queen’s Park and Spadina as Hoskin Avenue is closed as a games venue. This diversion is scheduled until September 6. 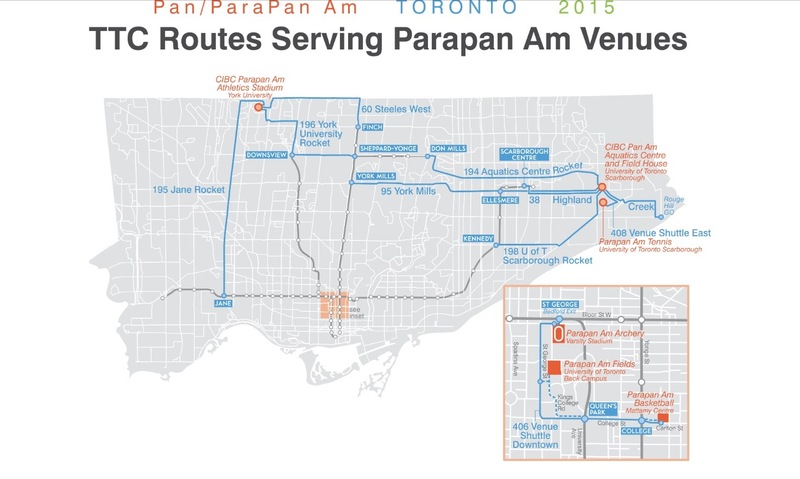 Route 6 Bay will divert via Dundas, Yonge and Queen on the afternoon of Saturday, August 15 for the Para-Pan closing ceremonies at City Hall. The base schedule for Sunday July 26 will be a Holiday schedule. Because this is the last day of the games, some Pan Am services will not operate: express services on Steeles West (60F) and York Mills (95E), the 194 Aquatics Rocket, and the 406 Downtown Venue Shuttle. 17A Birchmount peak period service will be extended from 14th Avenue to Highway 7, and headways north of Steeles will widen. This is a York Region request. 127 Davenport will be extended south to loop via Spadina Crescent to accommodate construction at Spadina Station. Buses will connect with the subway at on-street stops. This project is expected to be completed by the end of November. 47 Lansdowne will be adjusted to allow for delays due to road construction on Caledonia between Rogers Road and Eglinton. A northbound diversion is planned, but the route has not been announced. Due to paving and reconstruction at Eglinton Station, routes serving this location will be diverted as the work progresses to serve the south entrance of the station on Yonge Street. Service relief buses will be scheduled at Eglinton Station. The exact details of dates and the diversion routes are TBA. Due to paving and reconstruction of the bus roadway at St. Clair Station, routes 74 Mt. Pleasant and 88 South Leaside will loop on street via Avoca, Pleasant Blvd., Yonge and St. Clair. 97 Yonge midday service will use the streetcar loop. From August 1 to September 5, water main work on Broadview north of Danforth will require that streetcars be replaced by buses. 504 King cars will loop via Parliament, Dundas and Broadview to Queen. 505 Dundas cars will loop via Parliament, Gerrard and Broadview to Dundas. The schedules will not be changed. A replacement bus will operate on Broadview looping at the south end via Queen, Parliament, Dundas and River. This service was operated in the summer of 2014 when the construction work was originally scheduled, but not actually carried out.